ORLANDO, Fla. (AP) -- Orlando guard Gilbert Arenas was served with child support and custody papers as he left the court during halftime of the Magic's loss to Miami on Thursday night. The court documents, obtained by The Associated Press, were a California petition filed by Laura Mendoza Govan. She identified herself as his ex-girlfriend in the documents. The petition seeks custody and child support for three children that Govan says Arenas fathered and has since "financially cut off." She is also seeking support for another unborn child, as well as monthly support for the other children. In the petition, she is seeking $109,000 in monthly support payments from Arenas and $1.3 million annually. Govan could not be reached for comment. 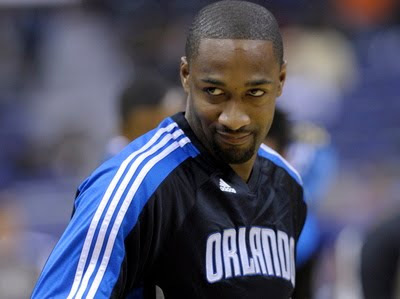 "Everything I say is reaction for something I did," Arenas said after the Magic's 110-92 victory at Washington on Friday. "She got served, so now she wants to say something on TV, that's all it is. I don't pay attention to it. My lawyer said I can take it because ... it's just reactions to reactions." He said he wasn't surprised by Govan serving him with the petition. He also disputed her claim that he hasn't supported her financially. Arenas' attorney, Lisa Fishberg of Washington-based Schertler & Onorato, said in a written statement that, "This is a private matter involving young children. It is inappropriate for Ms. Govan and her attorneys to attempt to turn it into a public spectacle. Gilbert Arenas has been extremely generous in paying monthly support voluntarily. The accusation that they have been 'financially cut off' has no basis in fact." Govan is originally from California and the documents say she has returned to the West Coast and that she and the children are living in a low-budget hotel. She claims in her petition that during the course of the relationship Arenas kicked her out of the homes several times. She says Arenas cut off contact with her and the children in early December, shortly before he was traded to the Magic and moved to Florida. AP freelance writer Tim Hipps in Washington contributed to this report.